14.3.2019 Lecture in Memory of Professor Mara Beller . Theodore Arabatzis, Department of Philosophy and History of Science, National and Kapodistrian University of Athens- Rethinking the Project of Philosophical History of Science. In the The Van Leer Jerusalem Institute. 28.3.2019 The Bar-Hillel Colloquium. Moritz Epple, Goete University- Frankfurt. The Theaetetus Problem: Some Remarks Concerning a History of Weak Knowledge. 4.4.2019 The Bar-Hillel Colloquium. Volker Roelcke, Director, Institute for the History of Medicine, Justus-Liebig University, Giessen- The Animal Model of Human Disease - A Core Concept of Medical Research: Historical Origins, Significant Manifestations, and some Implications. 11.4. 2019 The Bar-Hillel Colloquium. Shalini Randeria, Rector, Institute of Human Sciences, Vienna; Graduate Institute, Geneva. Dispossession and Capitalist Development: a View From India. 23.5.2019 The Bar-Hillel Colloquium. Orit Halpern, Department of Sociology & Anthropology, Concordia University, Montreal - The Planetary Bet. 26-31.5.2019 Conference- The Multi-Level Structure of Reality. 30.5.2019 Annual Lecture in Memory of Itamar Pitowsky. 5.6.2019 Special Conference in Memory of Sam Schweber. 5-6.6.2019 Conference- The Phonological Conundrum. 19-20.6.2019 Conference- Exceptionalist and Anti-Exceptionalist Perspectives on Logic. 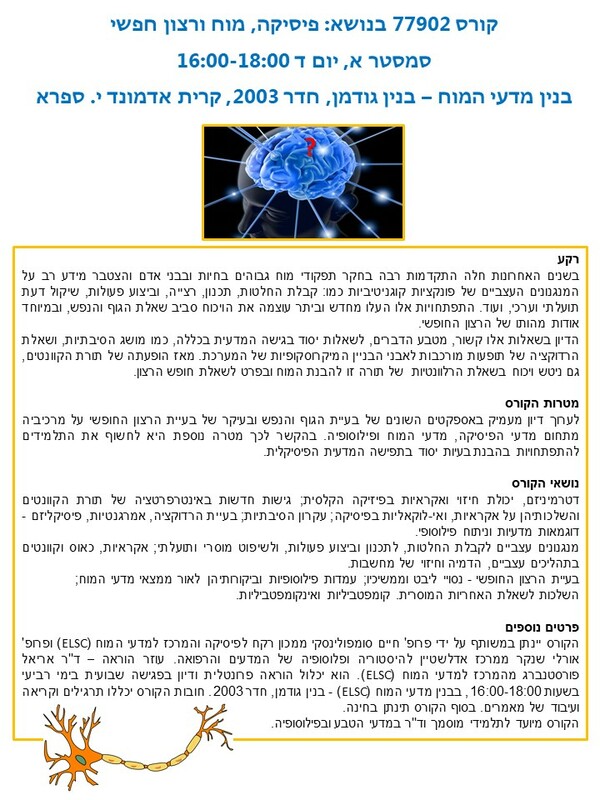 30.6-1.7.2019 Predictive Processing and its Role in Explaining Cognition. A joint conference with Ben-Gurion University. 13.12.2018 -Edelstein Colloquium. Burt Hopkins,University of Lille. Jacob Klein and Phenomenology. 27.18.2018 - Edelstein Colloquium. Hanoch Ben-Yami, Central European University. The Quantified Argument Calculus: Introduction, Current Achievements, New Directions. 3.1.2018- Edelstein Colloquium. Elay Shech, Auburn University. Colors, Perceptual Variation, and Science. 10.1.2018- The Bar-Hillel Colloquium. Ori Belkind, The Cohn Institute for the History and Philosophy of Science and Ideas, Tel-Aviv University- The Principle of Relativity: A Philosophical Examination.